Learn to build a real business from scratch even with no previous experience and without any hard costs. 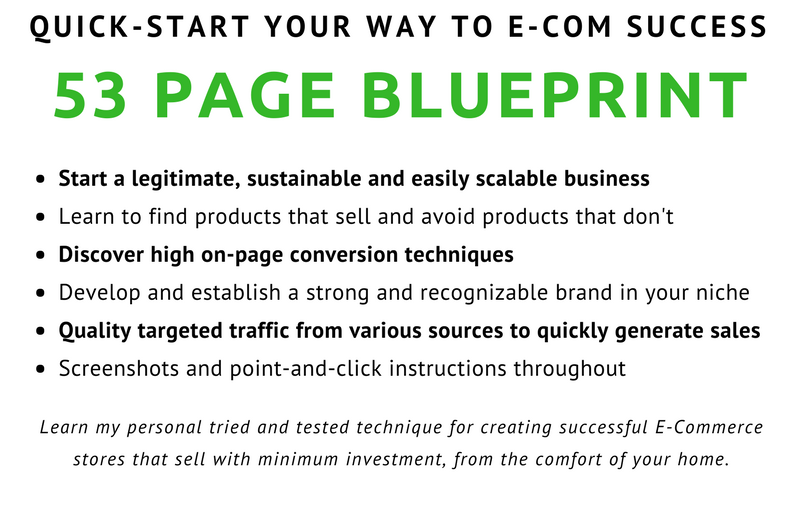 Eliminate guesswork by following a tried and tested blueprint that will enable you to avoid common mistakes and optimize your store for high conversions and long lasting success. This 53 page guide is a straight to the point blueprint that covers all of this and more. Quick Start your store to success and build a long lasting brand that you can profit from for years to come! 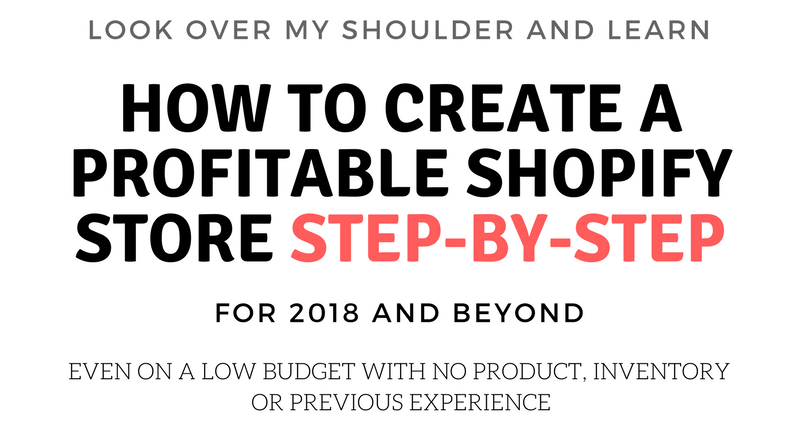 Build a real business at your own pace, work from home with no inventory and no employees, grow your customer list, increase exposure, expand your business and watch your profits grow. FOR SERIOUS BUYERS ONLY: This isn't a get rich quick scheme but a real business model that works. 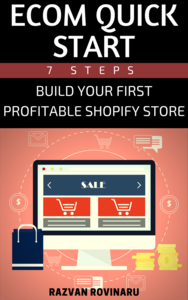 If you're ready to take action and start your own successful E-Commerce store then act now! You have all the tools to make this work for you so please put this information to use by taking action! 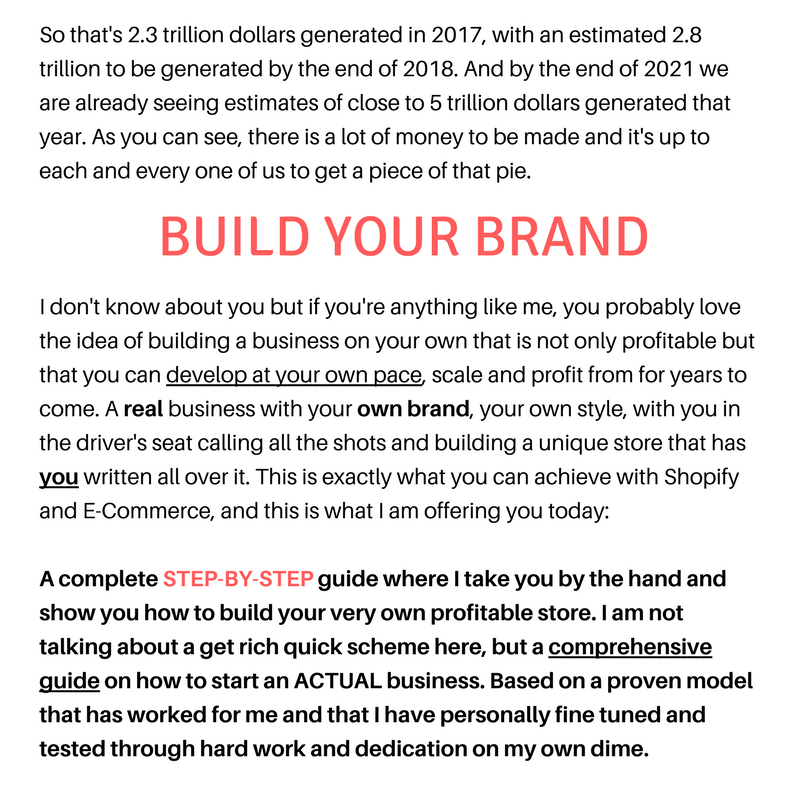 What is the minimum budget required to start: You'll need to buy a domain name for around $10, and the Shopify subscription once your free trial ends is $29/month. All other expenses are optional, although I would strongly recommend having at least $35 extra budget to start a $5/day FB Campaign. I also teach several free methods of getting traffic so technically the $10 required for the domain name will be the only initial investment you need the first 2 weeks. What if we have questions post-purchase: That's understandable. I've provided an email inside the guide where you'll be able to get in touch and ask your questions. Alternatively you can PM me here. The Traffic methods that you mentioned here are they with FB those basic stuff ? Is there other Traffic Formula you discussed other than google adwords , Google shopping etc . Nothing related to Google Adwords. I talk about several traffic methods, both free and paid - I wanted to focus on the sources of traffic that worked best for me, so it's FB ads + free traffic methods, all explained in detail. 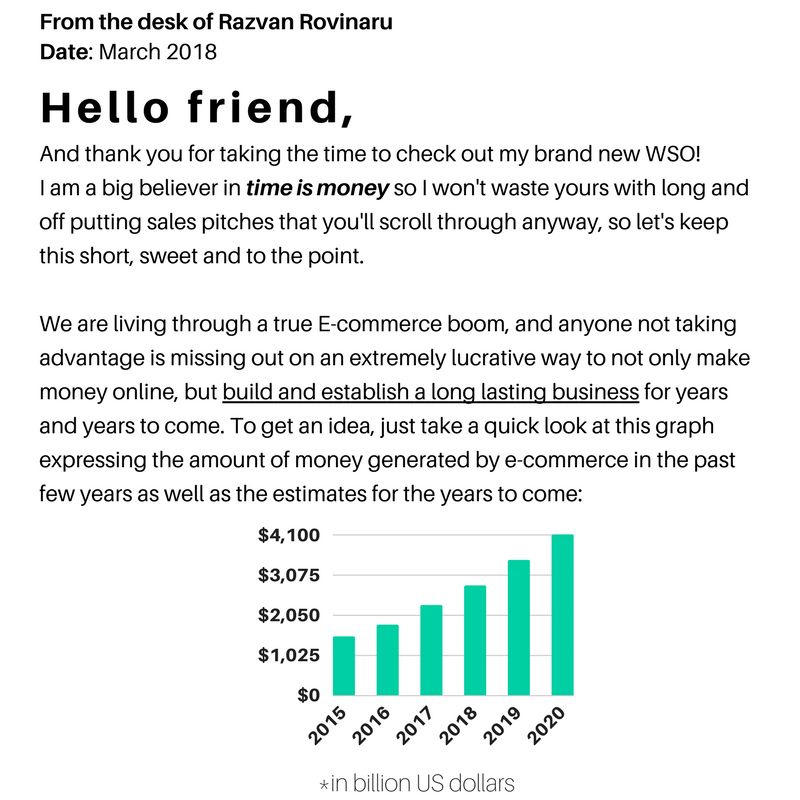 if you got no clue how to start dropshipping, this one is for you, PDF covers each small details to run and quick start your shop, NO BS, NO overwhelming stuffs, some tips i see good for conversion , gonna apply surely. Reserved for more Frequently Asked Questions.